I finally have the basics of my ZBrush character mapped out with plans to refine her in the coming days. First, let me tell you about her: the person on which she is based is a legendary figure in ancient China named Meng Jiangnu. Her story is one of the major epics in popular Chinese culture and is listed with other notable tales like The Ballad of Hua Mulan among others. Legend has it that she was the wife of a scholar and was therefore unaccustomed to hard physical labor, which becomes important later in the tale when he is conscripted by the emperor to build the Great Wall. Because conditions are unforgiving and the work strenuous, he soon falls gravely ill and appears to his wife in a dream to tell her of his misfortune. This prompts her to leave home to find her husband. The journey is long and difficult, but Meng is determined to find her husband, and find him she does. 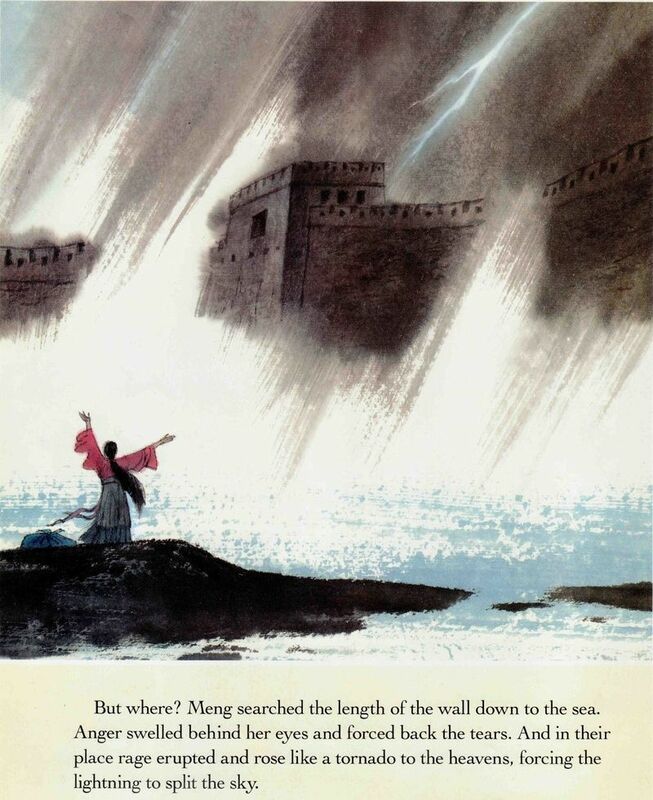 Sadly, he has succumbed to his illness and been buried in the wall, but Meng recovers his bones and destroys a section of the wall with a combination of anguish, grief, and magical realism. The emperor is none too pleased that his precious wall has been partially dismantled and seeks her out for punishment, but in a twist of fate, he sees her and desires to wed her instead. Naturally, she is not so pleased, but she agrees on the condition that her late husband receives a royal burial. After the funeral, she reneges on the deal and tells the emperor exactly what she thinks of him before leaping from a cliff and into the nearest bay, where the Wall meets the sea. In typical legendary fashion, her legacy lives on in the form of the silvery fish seen in Bohai Bay to this very day, or at least that’s what it says in The Journey of Meng. 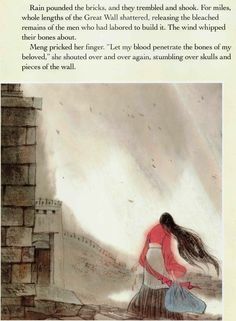 In any case, it wasn’t exactly her story that drew me to the character, but the evocative watercolor paintings of Yang Ming-Yi: the fluid brushstrokes, the contrasting pastels with the ebony of her hair and the lurid reds of her husband’s blood against the muted background of the Great Wall and the pale color of her hands. I simply couldn’t look away, so I chose her for my first ZBrush project and the rest is history. Given that I am currently bringing her to life in an animation class, I have also traveled with her to other programs, namely Maya, Marvelous Designer, and PhotoShop. She has undergone many transformations since her days as a low-resolution female template, but here’s how she looks so far. First (published) attempt at a hanfu template for my character. Something keeps happening with her sleeves, but that’s what I’m working with so far. I lovingly sculpted her face and hair in ZBrush and created the dress pattern in Marvelous Designer 6. I’m new to the software, so it’s still really fun to press the “Simulate” button and watch the dress being sewn together. Eventually, I will sew a hanfu for her that mimics the texture and lightness of silk with and bright–but historically accurate–colors and patterns. Depending on how long her dress is, I may get around to making shoes, but most of the ones I’ve seen have floor-length hems. I could go on because this is fascinating, but I’ll stop now.